August 23, 2017, 8:18 AM · Looking to play more modern music? The Kronos Quartet, one of the most inventive and pioneering string quartets to grace the planet, and their nonprofit Kronos Performing Arts Association (KPAA) have created an website initiative called Fifty for the Future: The Kronos Learning Repertoire, offering free online access to scores of newly-written quartets, along with recordings, program notes and video advice straight from the composers themselves. "Simply put, we've asked 50 of our favorite composers -- gifted and diverse composers from around the world, 25 men and 25 women -- to write pieces for our project," said violinist John Sherba, a member of the Kronos since 1978. Founded in 1973, the San Francisco-based Kronos Quartet's current members include Sherba as well as violinist David Harrington, violist Hank Dutt and cellist Sunny Yang. With a staff of 11, KPAA manages all aspects of Kronos’ work, including Fifty for the Future. So far, Fifty for the Future offers 16 newly-composed quartets; eventually there will be 50. "This music is available for anyone to download from the Kronos Fifty For the Future site for free," Sherba said. "And thanks to the generosity of the composers and KPAA, there are not going to be any publishing fees for anybody wanting to obtain the music." Commissioned by the KPAA with help from 32 other partners, including Carnegie Hall and other sponsors, the quartets are written for playability, aimed at student and amateur quartets but suitable for professional performance. Since February 2016, the Kronos Quartet has premiered 21 new works for the project and given 251 live performances of Fifty for the Future works. And people have been downloading them -- since November 2016 more than 3,100 scores and parts have been downloaded from 55 different countries and territories worldwide. The compositions represent a huge variety of modern styles and cultural language, filtered through the medium of a string quartet. For example: Would your quartet like to explore the musical vocabulary of the lute-like Chinese pipa, in a piece called "Four Chinese Paintings," by Wu Man? Or perhaps the balafon, a wooden xylophone from Mali, in "Sunjata's Time" by Fodé Lassana Diabaté? Or how about creating a southwestern U.S. soundscape, telling a Navajo story through a composition by Raven Chacon? The quartet dons the ornamental Indian slides and microtones for work called "Amrit" by Kala Ramnath, based on an Indian Raga. Nicole Lizée of Canada adds whistling tubes to her quartet, "Another Living Soul." Though the pieces are designed to train students, they are also meant to be works of musical art. "We want the composers to write the deepest and most beautiful piece that is inside them," Sherba said. "That's the main thing, for groups to experience a really fabulous new piece." They also want to inspire a new generation to explore modern works. "We want groups to go onto the site, listen to the music and say, 'Oh, I've got to play this!'" Sherba said. "And then we give them the tools: they can get the music; the composer's there on the Internet to talk about the piece; there's the recording; and beyond that, people can actually write us, too, and say, 'How can I do this better?' So there will be a lot of interaction." This summer, the Kronos recorded five more works for the project, and they anticipate completing all 50 in the next three years, Sherba said. "So far, about 25,000 people have interacted online with the project, all over the world," Sherba said. "We're doing a lot of mentoring, too." Since 2016 the quartet has conducted 90 Fifty for the Future workshops, coachings, and residency activities, serving 556 young musicians. 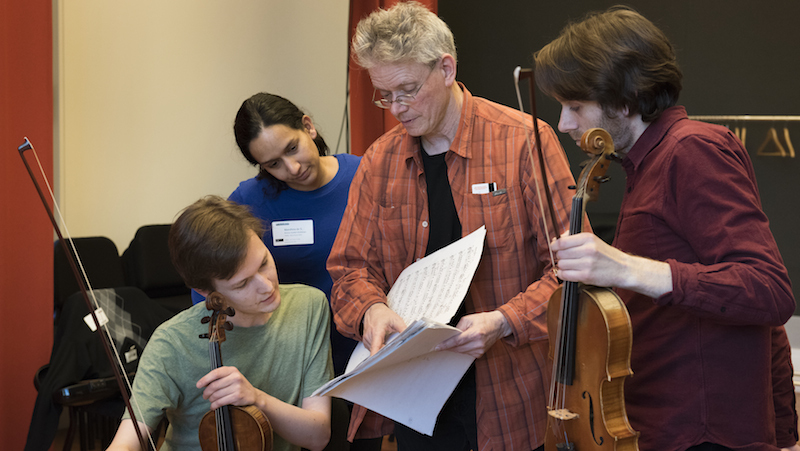 Kronos Quartet violinist David Harrington works with members of the Ligeti Quartet. Photo by Stefan Cohen. "A lot of the groups we're coaching are going online and downloading the pieces from Fifty for the Future, and they're ready to play them for us when we get there," Sherba said. "There's an added extra excitement for those groups." The quartet has traveled extensively, and they felt it was important to include selections from all over the world in Fifty for the Future. The composers they meet "are immersed in new techniques and new sounds, and how new music incorporates the older sounds from that part of the world," Sherba said. People studying these new works will need to be open to different ways of thinking about music and sound. "There are going to be a lot of new techniques and ways to describe music. I remember when we were working on an album we did called Pieces of Africa, with composers from all over Africa. During rehearsals, we'd be talking about how an elephant walks -- who would ever think that would come up in a quartet rehearsal?" Sherba said. "Another composer would use the word 'gluing' to describe the rhythmic aspect and how to stay together. We expanded our whole vocabulary of how to describe and talk about music. That's also the goal for anybody who would try to tackle all 50 compositions in Fifty for the Future, to expand the vocabulary." The Kronos Quartet is known for its dedication to modern music, though each musician has deep classical roots that inform their explorations. "We all studied with players who also were immersed in Beethoven and composers from that era, so it's in our blood," Sherba said. In the 80s, the Kronos Quartet often played a combination of modern and older music, but they found that this just divided their audience. "Some of them were angry that we were doing something new; and other people loved the way we played the new scores, and wanted to hear more of them. So we decided: let's really concentrate on doing new things." 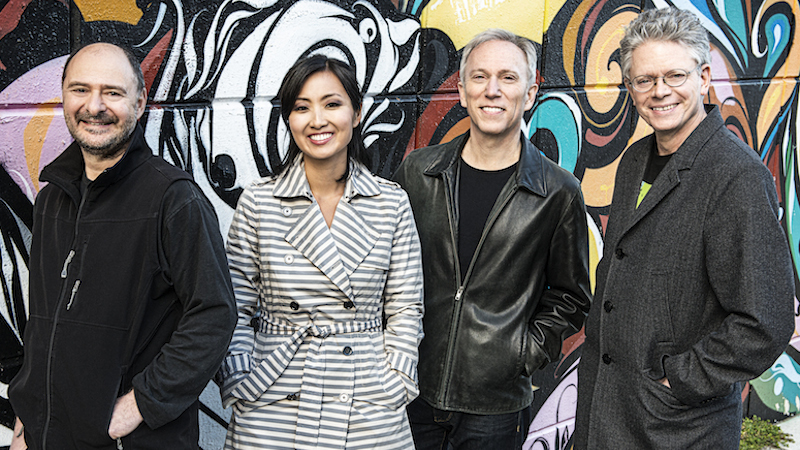 The Kronos Quartet: L-R: John Sherba, Sunny Yang, Hank Dutt and David Harrington. Photo by Jay Blakesberg. And they certainly have done so, commissioning more 900 works and arrangements for string quartet and working personally with many of the modern century's most notable composers. "Over the years, we've commissioned Henryk Gorecki, Terry Riley and Morton Feldeman," said Sherba, naming just a few. "Every composer is completely different, and they have their own history and attachments to the older composers. For example, we would talk to Gorecki and he would tell us, 'Play this like Schubert.' He also loved Mozart -- so Schubert and Mozart were flowing in his bloodstream, and that came into the music. I remember Morton Feldman -- we think of his music as very pointillistic, but he would actually tell us, 'Play this like Schubert, love each note.' He had the most beautiful descriptions of pizzicato, asking us to play it 'in kind of a Schubert way.' So we still have that running in our veins, and composers talk about this all the time in our rehearsals, too. Everybody is influenced by everybody." Besides the works by Wu Man, Fode Lassana Diabate, Raven Chacon, Kala Ramnath and Nicole Lizee, Fifty for the Future also includes works written by Rhiannon Giddens, Yotam Haber, Joan Jeanrenaud, Aleksander Kosciow, Franghiz Ali-Zadeh, Ken Benshoof, Garth Knox, Tanya Tagaq, Merlijn Twaalfhoven and Aleksandra Vrebalov. Frankly, it's pretty fun just to listen to their compositions! Click here to go to the Fifty for the Future website. Discussion: What's your favorite string quartet?